When I told Don last night that I’d received a couple of comments about these yesterday, his response was, “let’s make more! 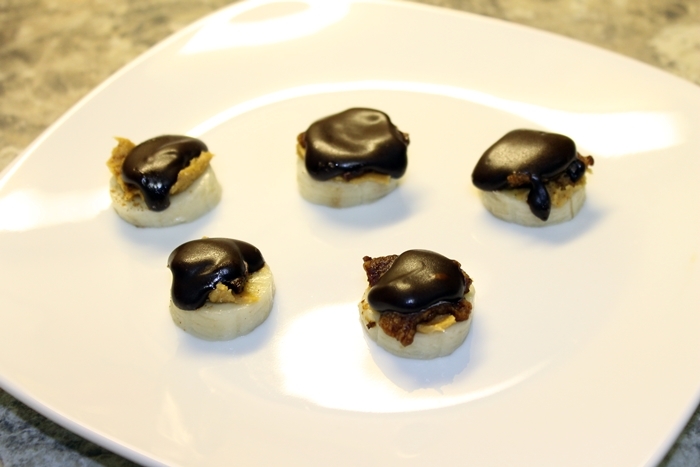 I know we can do better.” LOL So, here’s take 2 on the tasty banana treats. Don had the forethought to cut the bacon into bite size pieces before cooking it. 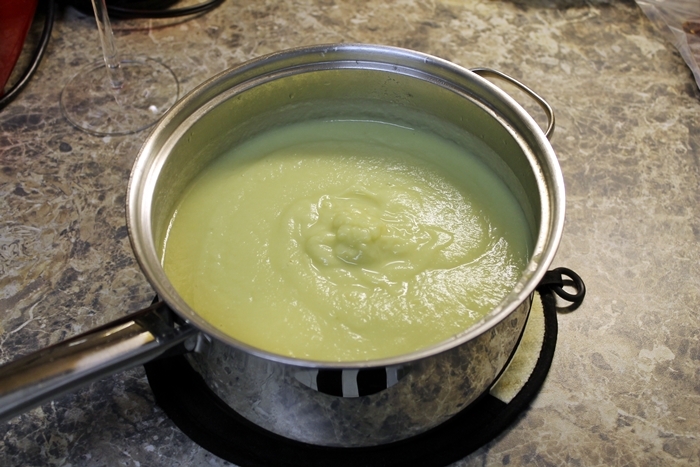 If you are frying in a pan on the stove I think this would be a hassle but we bake it in the oven and it worked out great. 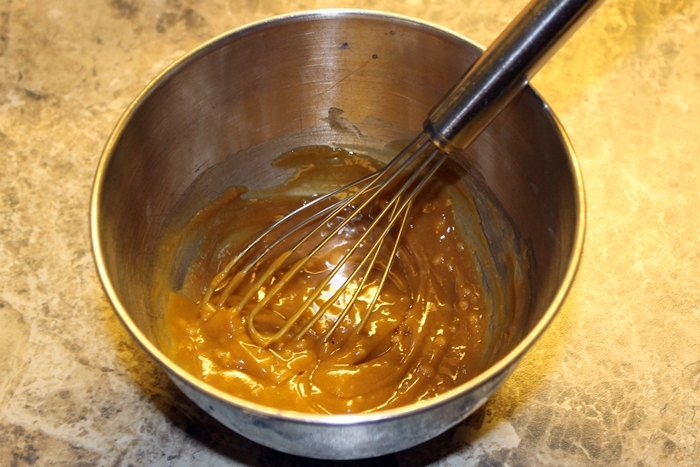 The pieces were more uniform rather than baking it as a long strip and then trying to break it into pieces later. (My previous method.) 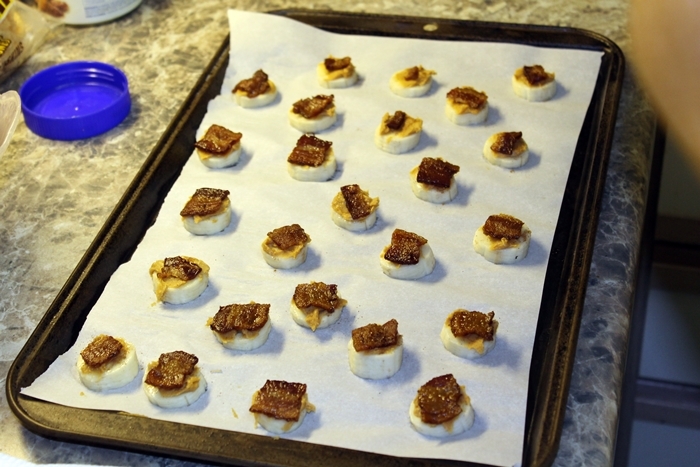 Our bacon pieces went into the oven on parchment paper at 350 degrees, for about 25 minutes. 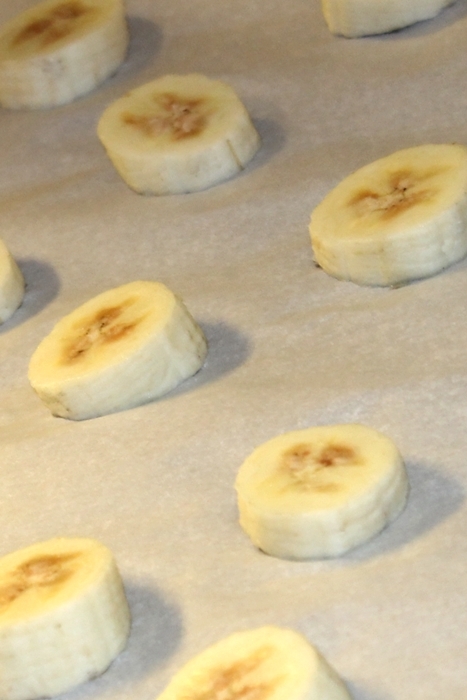 While they baked, Don cut up two bananas. He went with a different configuration. Into the freezer for a few. Added bacon. Somewhere in here he dusted them with cinnamon too. Drizzled Blobbed on the bites. So pretty… Back into the freezer with you! 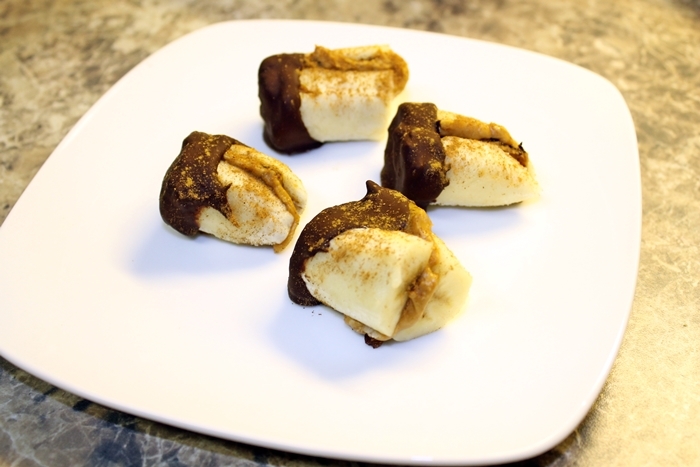 I came across these Chocolate Bacon Almond Butter Bananas at Civilized Caveman Cooking a couple of weeks back and I thought they would be fun to try. Not the easiest thing to make. Bananas get a little slippery. 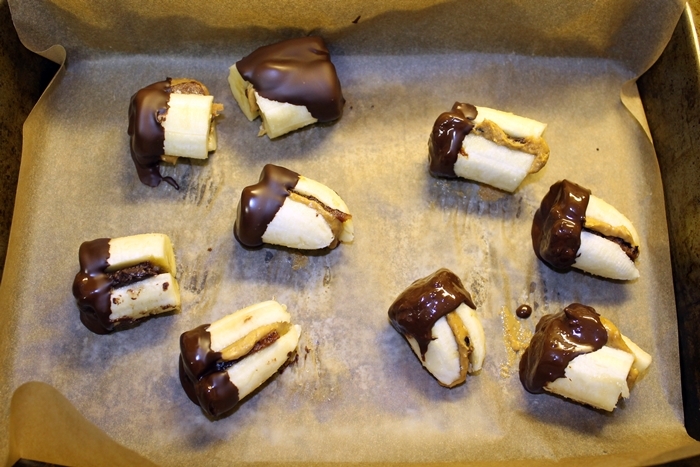 For my first attempt, I thought one banana each would be enough. What if we didn’t like it? I didn’t want to waste all that banana and bacon. Although, honestly, when there’s bacon, you can hardly go wrong. 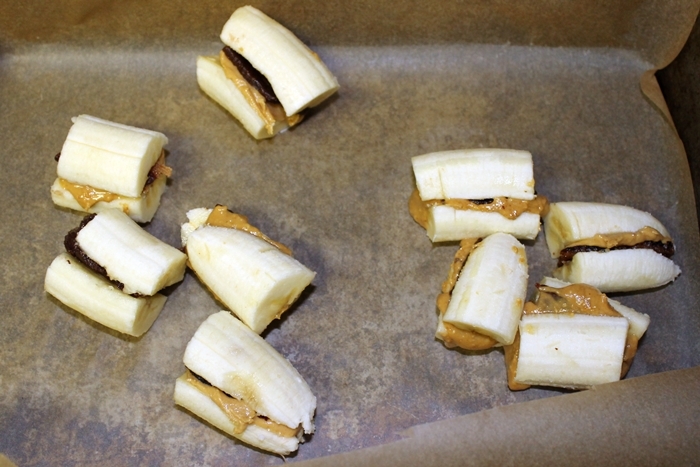 First I sliced up the two bananas and cut them into what I thought would be bite-sized pieces. Hmm…more on that later. That turned out to be 4 pieces for one and 5 for the other. I placed all the pieces in the freezer (on parchment paper) while I fried up some bacon. I only needed two strips. 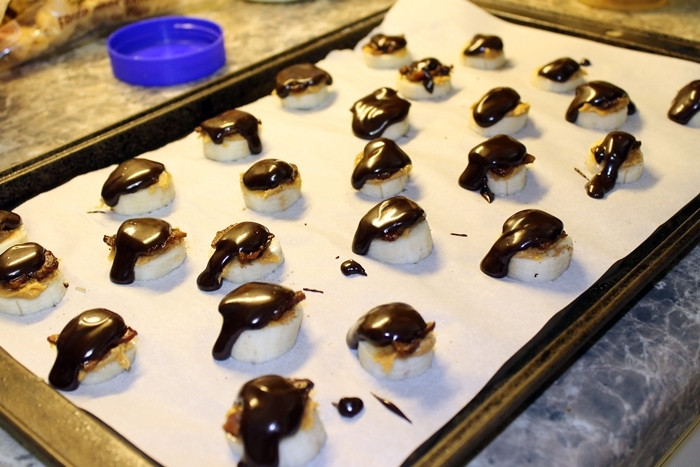 I made more of course and we enjoyed the bacon à la carte while I worked on the rest of the treats. 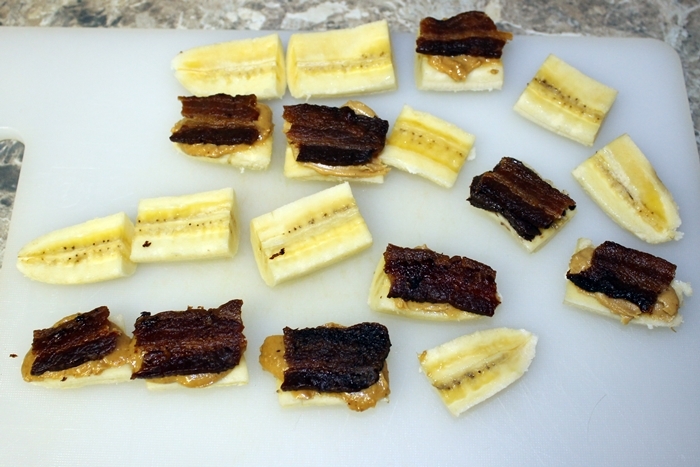 Once the bacon was cool, I pulled out the banana pieces and attempted to smear a little bit of almond butter on each one and top it with bacon. This is not easy to master however I persevered. Then I sandwiched them together and placed them back in the freezer to firm up. Next I used two pans to make a double broiler and I melted some organic dark chocolate chips. Maybe about a 1/2 cup; I was totally just eye-balling it all. 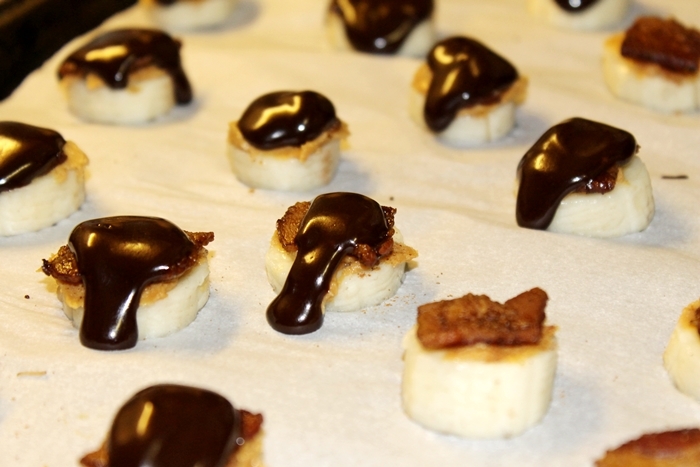 When the chocolate was melted, I grabbed my bananas and ran them through the chocolate, coating one end. Then, back in the freezer. That night we dusted them with cinnamon and tried a couple after dinner. The verdict? Good flavors. Not so good execution. The “bites” are too big to eat in one bite and if you try to eat them in small bites, they tend to make a mess. Not so much for me but Don just couldn’t handle the small bites. 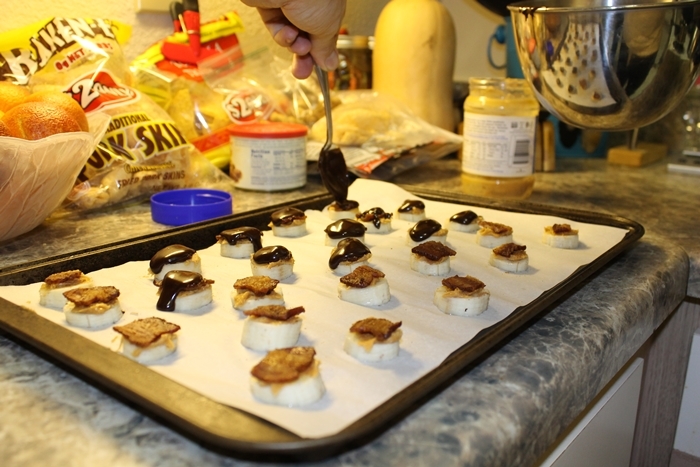 LOL He was encouraged by the combination though and wants to try again, making the pieces small enough to pop all in one bite. Don’t live life like it’s another day, but live life like it’s your last day. 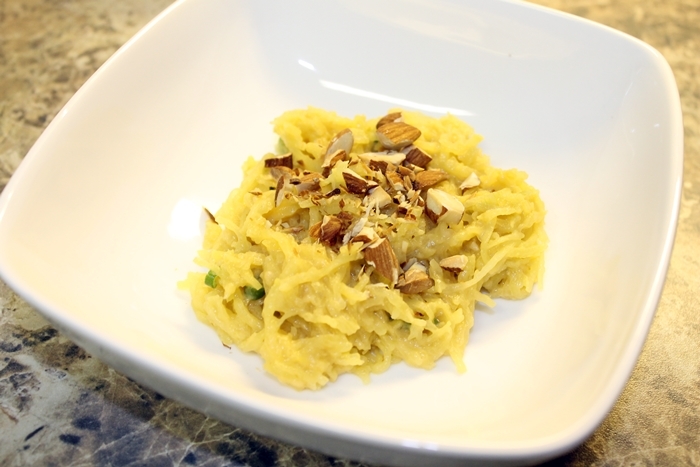 If you like spaghetti squash, here’s a new dish you might not have tried before, courtesy of Cat at Things My Belly Likes. I could not come up with a new name, so forgive me Cat for naming my post Nutty Noodle Salad as well. 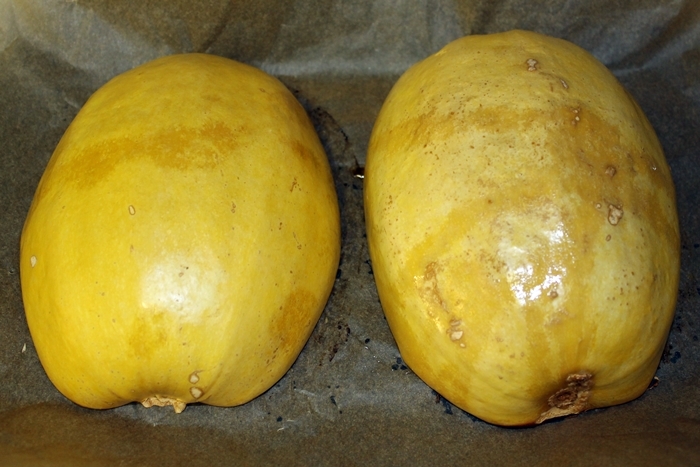 This was the first time that I roasted a spaghetti squash in the oven rather than microwaving it. It takes longer, but we really like how it came out. 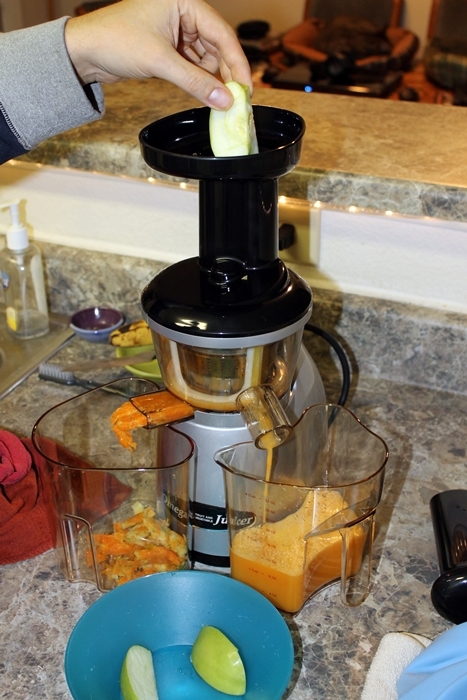 The flavor is slightly different, it’s not watery like when microwaved, and the texture even seemed slightly different. Thumbs up for roasting. I think we’ll take the extra time, when possible, to roast from now on. I roasted the squash for 60 minutes at 375 and then let it sit for about 15-20 minutes to cool. 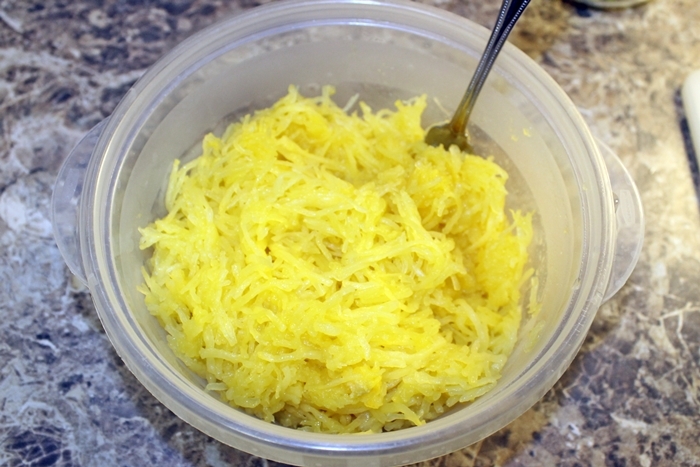 Cut in half, brush with olive oil, and place face down on a baking dish. 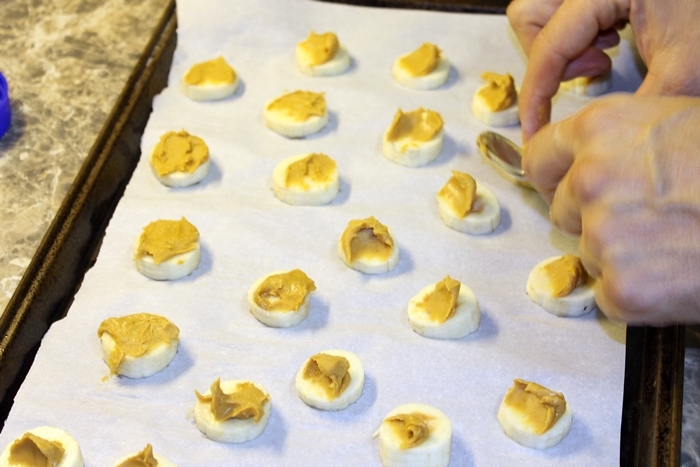 We like to use parchment paper over a cookie sheet. 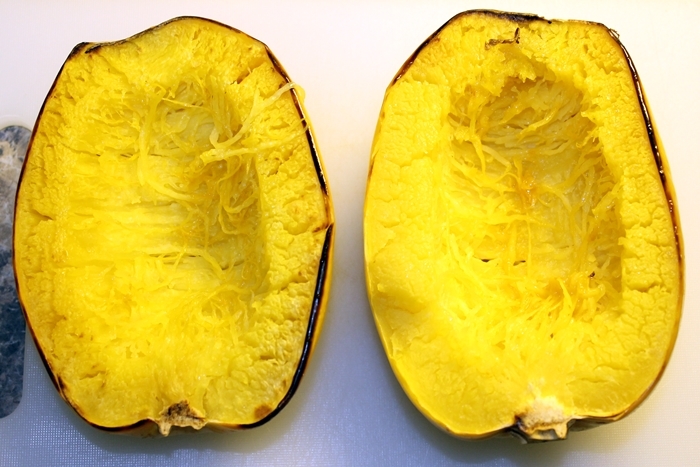 Once cooled, turn over, remove the seeds, and then use a fork to remove the squash. While the squash cooked, I made the dressing by combining the sunflower seed butter, garlic, sesame oil, honey, balsamic vinegar, and lemon juice. 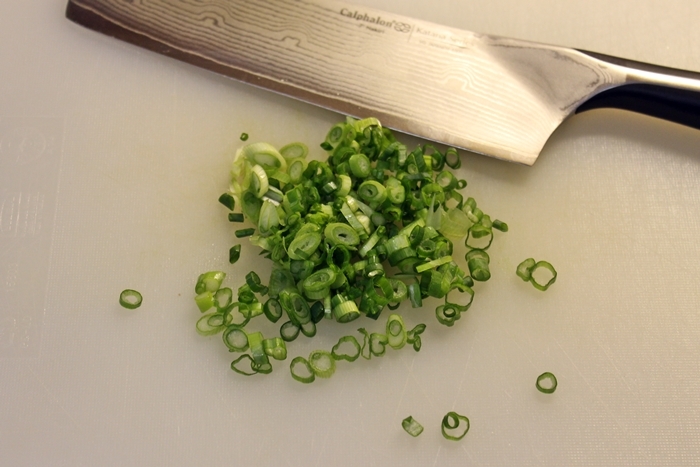 Then I chopped by chives. And prepped the almonds. 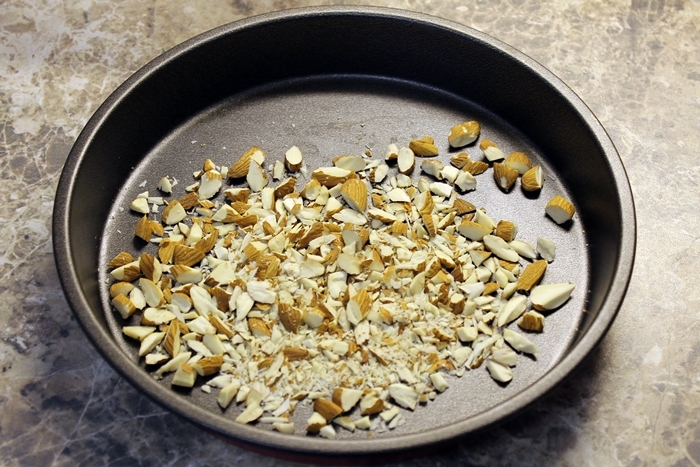 When the squash came out of the oven, I set the oven to broil and toasted the almonds for about 5-8 minutes, checking them frequently so they didn’t burn. 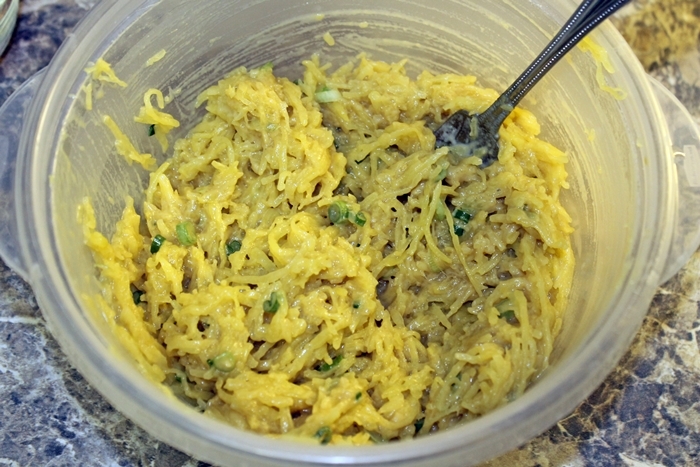 While the almonds toasted, I added the dressing and chives to the squash. We had a quick taste, topped with almonds. Then placed the rest in the fridge to chill. We did like it better chilled the next day. This was a success for us. The only thing we might change next time is to try a little less sesame oil. The sesame flavor was just a little too strong for us. But overall, we enjoyed it and the leftovers certainly didn’t go to waste. 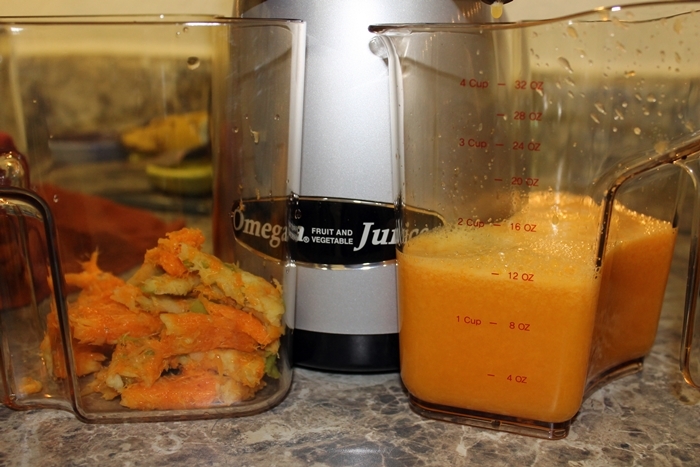 Thanks again Cat for another great recipe! 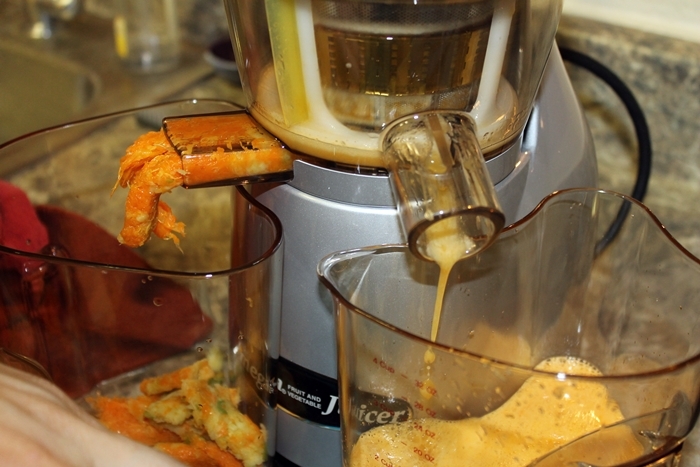 Thanks to Cat for posting this on her blog and making it sound interesting enough to try. 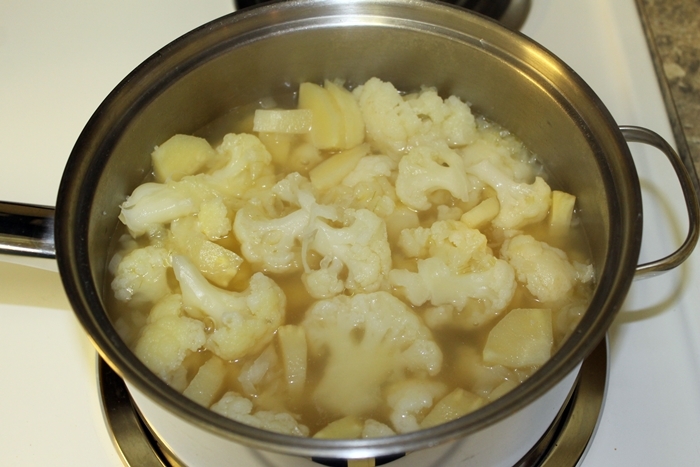 Using a large saucepan, I sauteed the onion for about 5 minutes and then added the cauliflower, parsnip, and chicken broth to the pan. 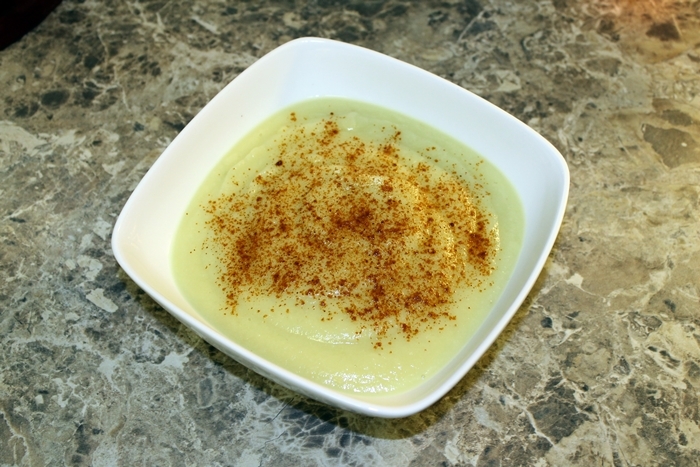 We dusted our bowls with a little cayenne for a little pizzazz.